"Some would have you believe that it’s just grand old mansions, castles and the like that are afflicted with sprites and bogles. Stirling Castle, after all – the fabled, favoured seat of the Stuart Kings, has such a catalogue of creeping sprites that you’d need am ectoplasmic ‘Who’s Who’ to keep track of all the stately spooks who linger there. Mind you, it’s not just the grand buildings here that harbour hauntings with royal connections. 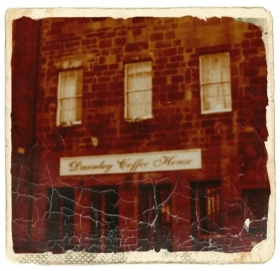 Down by the very foot of Broad Street you’ll find the Darnley Coffee House, which some folks say is plagued by a playful poltergeist. Now, if you hark tae the worthies that write the guide-books you’d think it was just a humble hostel where - once in a while - Lord Henry Darnley, second husband tae Queen Mary, used to rest his head when she’d taken a strop an kicked him out of the Castle for the night. Not quite true. You did rent rooms, but it was, shall we say, a special kind of hostel…the sort where you rented your room by the hour, and it wasn’t just ghosties and ghoulies that went bump in the night. It was there, mere months before he’d be blown up by an assassin’s bomb at Kirk o’ Field, that Darnley, dandy that he was, dallied awa' the evening after the baptism o’ his son, Prince James – who would grow to greatness as James the Sixth o’ Scotland an’ First o’ England. On that same eve dear Mary was having herself a fine time wae James Hepburn, Earl of Bothwell, up the street in Bruce of Auchinbowie’s house. The same Bothwell, that is, that folk think planned the pyrotechnic passin’ o’ Hooray Henry. Mary had visited he Earl to give him a gift of a blue silken suit, as a gift for attending the baptism of her heir and – by all accounts – stayed to do the fitting herself. Charlie an’ Camilla don’t seem so bad, now, do they? Could it be that the spook that causes lights tae switch themselves on in dead o’ night, an’ pots tae hurl themselves around the kitchens of the Coffee House was a ‘professional acquaintance’ of poor dead Darnley? Perhaps. The café area once served as stables to the brothel, where gents could tie their horses before climbing the stairs to the warm welcome waiting in the rooms above. An early form o’ ‘Park an’ Ride’, in fact!"